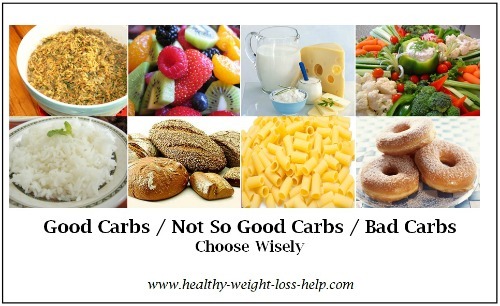 Lose Weight and Stay Healthy by Choosing Carbs Wisely. Good carbs vs bad carbs can be pretty simple by remembering this tip. Avoid foods that are refined, made with white flower and have added sugar. Instead, choose healthy carbohydrates by eating unrefined plant foods. We simply need carbohydrates to supply our bodies and brain with fuel, giving us the daily energy we need to function. The glucose is what gives us energy, though any calories (energy) not used is stored in the liver for future use. If we consume more calories than we need, it will be stored in the body as fat. Carbohydrates are almost exclusively found in plant foods, such as vegetables, fruits and beans. They are also found in milk products which are the only foods derived from an animal source that has carbohydrates in them. Carbohydrates are divided into two groups which are simple and complex. Simple forms of carbs consist of simple sugars such as fructose (derived from fruit), sucrose (table sugar) and lactose (derived from milk sugar) (along with a few other sugar sources), such as honey and fruit juice. Not all simple carbs are bad for you. Fresh fruit for instance is a wonderful, healthy source of simple carbohydrates that not only offer energy, but also offer a plethora of vitamins, nutrients and antioxidants. Yes, complex carbs contain sugar too, but the sugar molecules are longer and more complex, hence the name. Complex carbs include starches and fiber, foods such as vegetables, beans and whole grains. Complex carbohydrates that are found in whole grains, legumes, vegetables are a healthy choice of carbs to eat. They provide a steady source of energy (not a spiked sugary energy that drops quickly that can fluctuate your glucose levels). Though we must be careful as some complex carbs are often refined depleting them of nutritional value.What are refined carbohydrates? This is when certain foods are processed, removing much of their nutritional value and fiber content. Consider these foods that offer us little or no nutrition, but they do offer many empty calories. Foods like pasta, sugary cereals, white bread, white flour, white rice (anything made with white flour) are all considered refined carbohydrates. Avoiding refined carbs, (along with sugar) always helps with weight loss. Choose unrefined foods such as fruits, vegetables, beans (legumes) and whole grain items. Avoid refined processed foods such as desserts, sugary drinks and candy. High fiber carbohydrates (beans and legumes) are wonderful as they add roughage to your diet, which aids in digestion, prevents constipation and hemorrhoids and may reduce the risk of colon cancer. High fiber foods also help lower blood cholesterol levels, which help reduce the risk of heart disease. Eating large amounts of sugary refined carbs can lead to health problems such as diabetes, obesity and hypoglycemia (low blood sugar). Foods high in refined simple sugars is often high in fats (cakes, cookies). How Many Carbohydrates Should We Be Eating? It is recommended that about 60 percent of your daily calories come from healthy carbohydrates. If you want to eat healthy or lose weight you must choose good carbs vs bad ones by avoiding refined and highly processed foods. The simpler and less processed a food is, the better. Like fresh fruits, vegetables, whole wheat products, most legumes, nuts and seeds and also dairy products that have no added sugar or fat. Fruits and vegetables contain only natural sugars and are plentiful in fiber. They provide lots of vitamins, minerals and antioxidants. They have little to no fat and are usually cholesterol free. Now if you purchase canned or frozen fruits and vegetables and also fruit juices, they offer less nutrition due to the high heat needed to process them. They also usually contain added sugars and/or salt and preservatives. When selecting grains and cereals, choose whole grains because they are high in fiber and offer nutrients. When it comes to dairy products, select low fat products and try to avoid dairy products that have added sugar. If you're a pasta and bread lover like I am, try to make those meals a special occasion and enjoy them only once in a while.